THE VOICE Back again this year we are proud to have the Voice of Volkswagen Drag Racing, "Dyno Don" Chamberlin as our special guest MC. Dyno is a legend in the Volkswagen scene dating back to the '70's and the California Bug-In's. He is internationally known having been a contributor to Hot VW's and most recently announcing the new European Bug-in's as well as Winterjam in Florida. CAMPING This just keeps gettign better and better. Last year we had about 175 people brave the wilds of nothern New Jersey. There is a special area next to the show field specifically designated for camping complete with showers and clean bathrooms! Plan on bringing your own marshmallows, smores and tall tales to tell around the bonfire. PARTY Saturday night the Central Jersey Volkswagen Society will be hosting a party in the clubhouse with live music and dancing. The kitchen will be open as well as the bar! So there will be tasty brats and beer for all to enjoy. CARSHOW The feature event, the car show is on Sunday from 9am to 3pm. Last year we had about 385 of the northeast's air-cooled finest. Daily drivers to trailer queens, as long as they are air-cooled, they are all welcome. Get to the show early, last year we started to run out of room in some classes. Show entry closes at noon! RAFFLE Bring an extra few bucks for our mega raffle. We will be announcing winners every hour. With the generosity of our sponsors, chances are good that you will go home with a prize. We will also be having a 50/50 that will be awarded just before the trophies at the end of the day. Last year the lucky winner went home with almost $250! KLUB KOMPETITION "DUB PUSH" Calling all Clubs, put together a Dub Push team and challenge last years champions! This year the South Philly Van Club will be back to defend their top honored position. The Champions will not only receive a medal, they will also have their club name engraved on the Kompetition Kup and will take possession of it for a year. Click here for more details. VEE DUB COLORING AND CUSTOMIZING For a little creative quite time for the kids, we will also have coloring tables set up with full page images of our favorite cars for the kids to color. Want a little practice? Download the official All Air-Cooled Gathering coloring pages here. HOT WHEELS DRAG RACING What kid doesn't love Hot Wheels and Drag Racing. 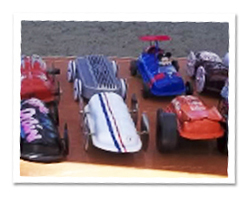 This year we will have Hot Wheels Drag Racing competition for the kids in which every kid who participates will go home with a new Hot Wheel car! A BEETLE BASH? Are we sending the wrong message here? Starting our kids off beating up a precious Volky? No, just a little Beetle Pinata fun to help burn off a little energy.